The Silhouette Man (192 pages) was honored in Canada as a book that celebrates the wisdom of seniors. It is geared adult readers. The First Thirty (96 pages) is the condensed edition of the book, geared toward 5th grade through college reading level. It was NSDLC Multicultural Relations Book of the Year. A Place To Sit is the companion workbook that can be used with either book. The Milkshake Man (40 pages) is the next book in the series - the picture book edition of the story, geared toward Kindergarten through 4th grade reading level. 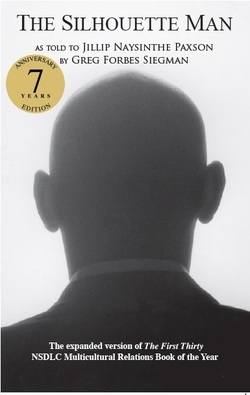 Scroll down to see the front & back covers of the 7th anniversary edition of The Silhouette Man, the 10th anniversary edition of The First Thirty & the current edition of A Place To Sit as well as some relevant notes. There are also links you can click below - to read additional reviews, see the Readers Gallery &/or order copies of The First Thirty, The Silhouette Man &/or A Place To Sit. To learn more about the next book in the series (The Milkshake Man), click here. To see the page 1 reviews inside The Silhouette Man, click here. To read additional reader & media reviews, click here. To see pictures of book readers, click here. To order copies of the books, please visit our Store. To place bulk orders - or to order copies for a bookstore or library - please contact us here. To see the page 1 reviews inside The First Thirty, click here. To read additional reader & media reviews, click here. To see the page 1 reviews inside A Place To Sit, click here. To read additional reader & media reviews, click here. If the cover of The First Thirty above (man looking out window) does not look familiar: In February 2015, The First Thirty celebrated its 10th anniversary with a new edition that included a brand new cover as well as tweaks throughout the text. This image here (boy in football helmet) reflects the original edition's cover.